From childhood, U.S. Rep. 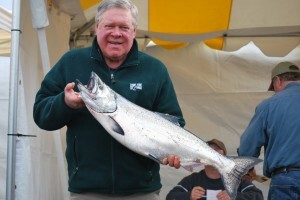 Norm Dicks was destined to become an advocate for salmon and ultimately a champion for the entire Puget Sound ecosystem, according to recent comments from his family and friends. Norm Dicks on a fishing trip in 2010. Neil Werner, executive director of the salmon center, said Norm embodies all the criteria for hall of fame inductees, such as a passion to restore wild salmon, a willingness to share knowledge and much success in making things happen. Listing the criteria, he said, is like describing Norm Dicks himself. I won’t list all the accomplishments that Neil cited during an induction ceremony two weeks ago, but they included Norm’s leadership in obtaining congressional funding for a variety of programs to restore salmon in Puget Sound, to heal the Puget Sound watershed (including federal lands) and to increase our understanding of how the ecosystem works. 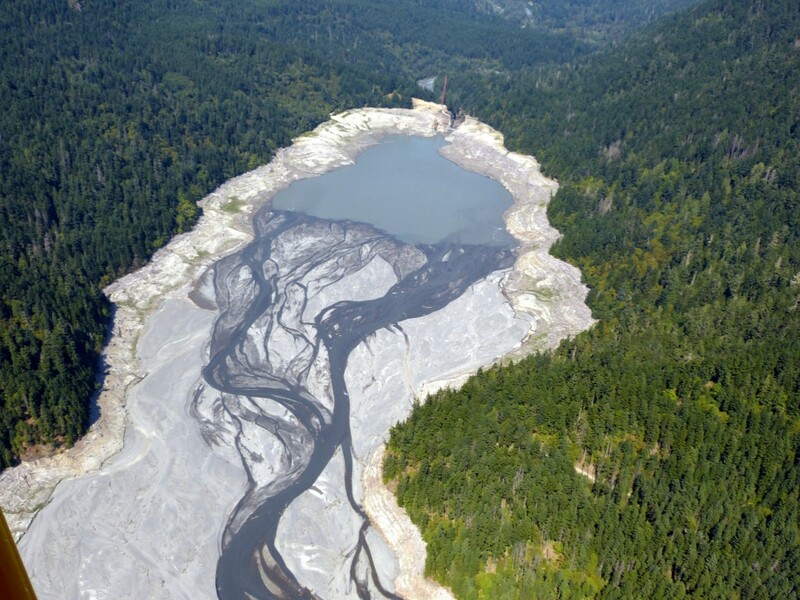 As a result, salmon have regained access to 900 miles of stream habitat, including the nearly pristine watershed above two dams on the Elwha River. “We will see the benefits of what he has done for an awfully long time, if not in perpetuity,” Neil said. 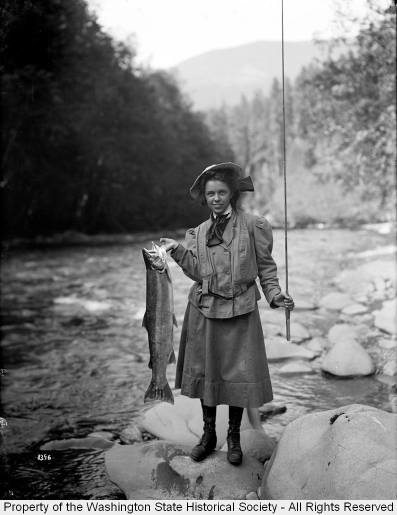 Eleanor Chittenden with a prized steelhead on the Elwha River in 1907 during an expedition with The Mountaineers. To bring the wonder of historical photos back home to Washington state, I pulled this fabulous photo of Eleanor Chittenden fishing on the Elwha River in 1907. It’s from a collection managed by the Washington State Historical Society. Eleanor, 15 in this picture, was the daughter of famed engineer Hiram Chittenden, who worked for the U.S. Army Corps of Engineers in connection with the Port of Seattle. The photo, by Asahel Curtis, was taken during an expedition to the Olympic Peninsula with The Mountaineers. Eleanor was no doubt proud of her catch, a very nice steelhead. 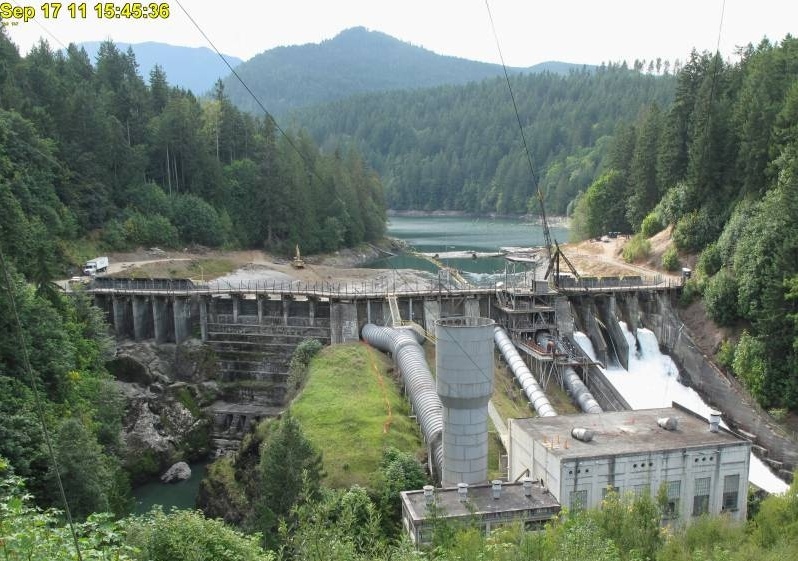 Of course, this was many years before a dam was built on the Elwha. Bob Royer wrote a nice piece about “The Girl and the Fish” in the Cascadia Courier, a blog that relates history to present-day events. 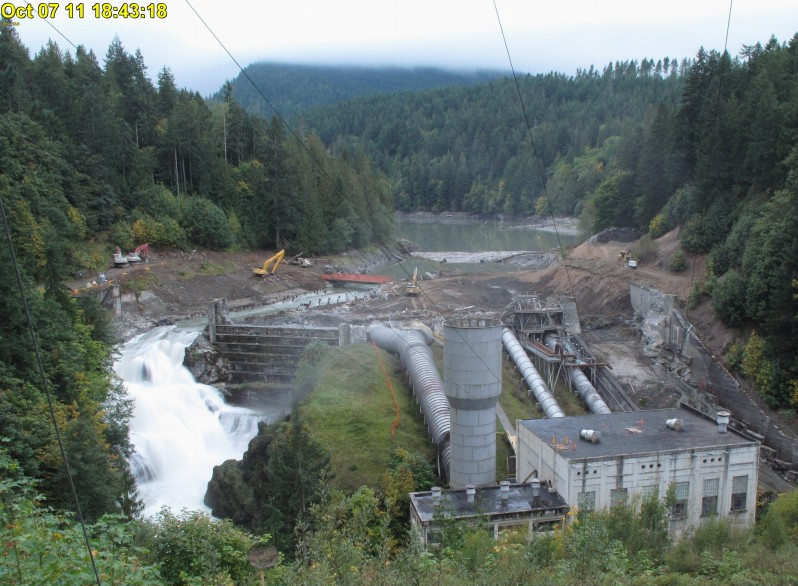 I’m looking forward to watching the two dams on the Elwha River being dismantled — and I won’t have to leave home. 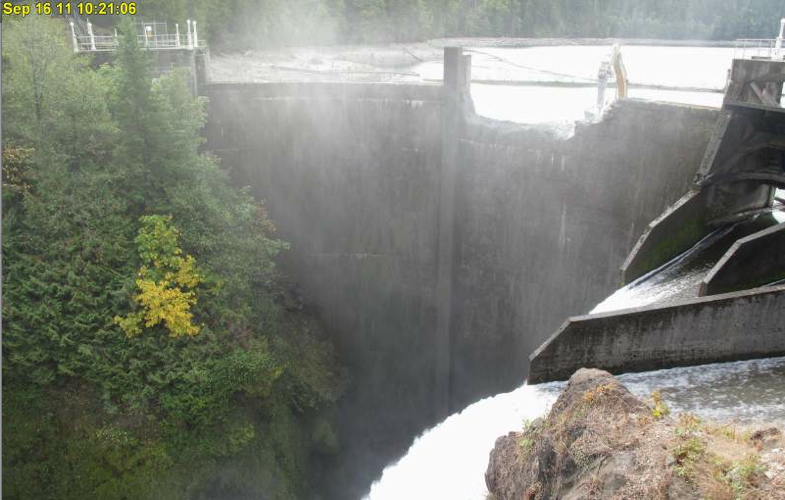 In this July 9 photo, water was pouring through the spillway gates of Glines Canyon Dam. 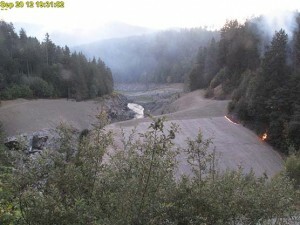 Since then, the reservoir has reached a low of -18 feet pending demolition, and the spill has declined. 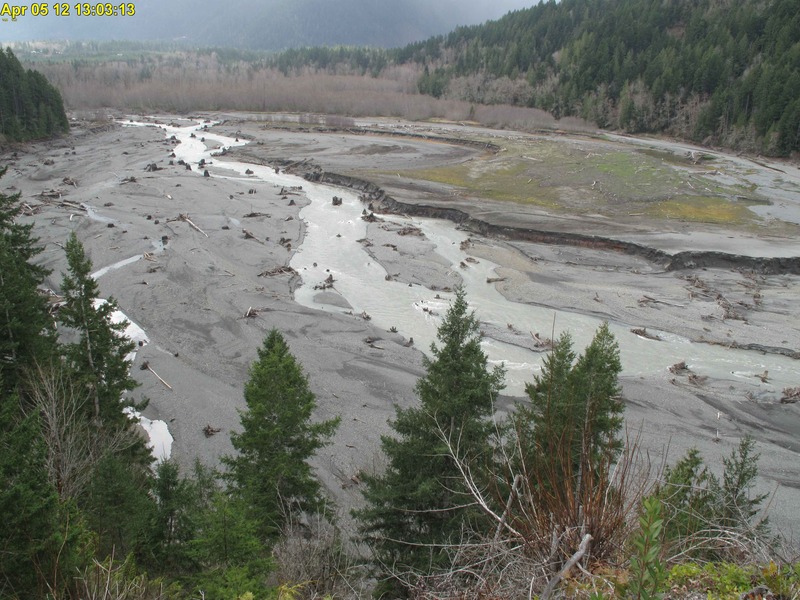 Sure, I’ll try to make a few trips to Port Angeles and up the Elwha valley to see what I can see at various times. But webcams placed in strategic locations may actually be the best view around. 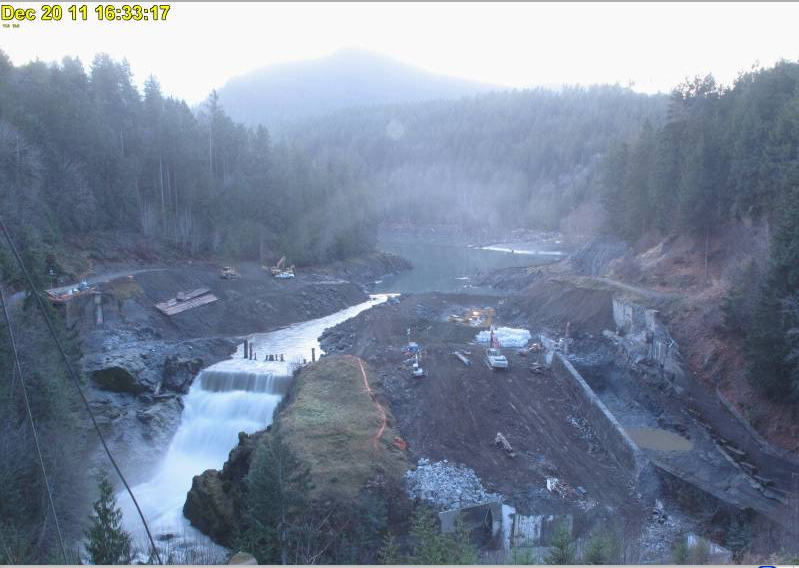 We won’t be able to judge the quality of the view from the webcams until they are installed later this month. 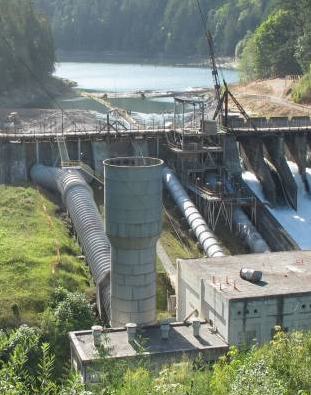 At least that’s the proposed timing, according Olympic National Park officials who are doing their best to help people share the experience of dam removal. I outlined the options for viewing and information gathering in a story in Sunday’s Kitsap Sun. In addition to webcams, park officials are working to find ways for people to stay connected with the project, both in person and on-line, as I describe in my story. For ongoing information, there is Facebook, a blog and general information about the dams and dam-removal project. Not to leave out fun, culture and education, a weeklong celebration is being planned about the time the contractor gets the go-ahead to work in the river on Sept. 15. 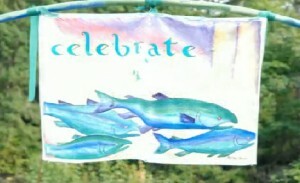 For a calendar of events, go to the Celebrate Elwha! website. 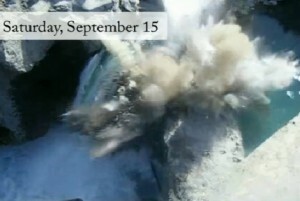 Meanwhile, reporter Lynda Mapes of the Seattle Times was able to capture the sites and sounds of the changing environment as the declining water levels reveal conditions never seen before without scuba gear.